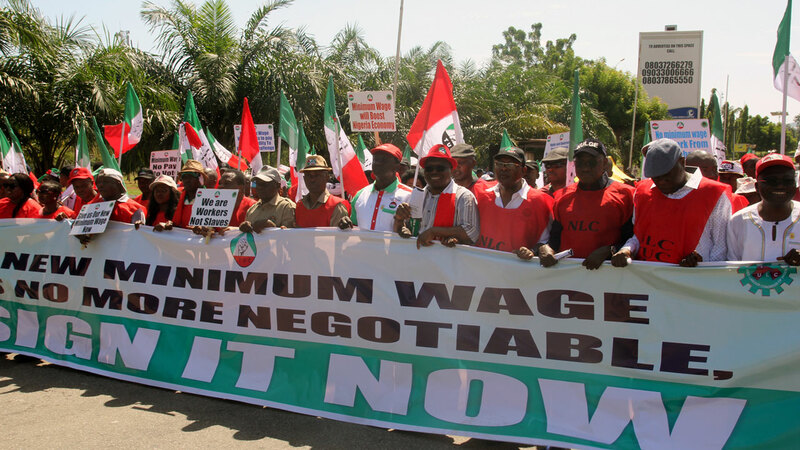 [FILE PHOTO] Organised labour and civil society protesting for new minimum wage in Lagos. November 1. Another earth tremor hits Abuja. The Federal Capital Territory (FCT) witnessed a fresh earth tremor with a magnitude of 3.0 few months after a similar occurrence in the city. November 2. Buhari receives confirmation of WASC Result. Official of the West African Examinations Council (WAEC), in Abuja, presented to President Muhammadu Buhari, the attestation and confirmation of his 1961 West African School Certificate (WASC) Examination result. ** Man jumps into Lagos lagoon. November 4. ASUU begins strike, labour mobilises for tomorrow Organized labour did not attend the conciliatory meeting with the Federal Government’s team in Abuja. It said it was not invited. In a related development, the Academic Staff Union of Universities (ASUU) asked its members nation-wide to begin an indefinite strike. November 5. Relief for Nigerians as Labour suspends strike. The Nigerian Labour Congress (NLC) and the Federal Government succeeded In averting what could be a complete lockdown of the economy over disagreement on minimum wage for the workers. Led by the NLC President Ayuba Wabba, the organized Labour insisted on a N30,000 minimum wage for workers in the country as against government’s N24,000. But Ayuba announced a suspension of the proposed action. * INEC deletes 300,000 names from voters’ register. November 6. How I escaped assassination by Ike Ekweremadu. Deputy Senate President Ike Ekweremadu relived how he escaped an assassination attempt, declaring that no one was safe in the country. He said, “ It was about 4:00am that some people evaded the security in my house and got all the way to my room where I was sleeping with my wife. There was a fight with heavy commotion. By God’s Grace, we over powered them. We caught one of them and the rest escaped. November 7. Buhari swears in CCB chair, NPC commissioners. President Muhammadu Buhari swore in the chairman of the Code of Conduct Bureau (CCB), Dr Mohammed Isah, and six other members. He also inaugurated 23 commissioners of the National Population Commission. * President mourns Sunny Odogwu. President Muhammadu Buhari commiserated with the Odogwu family on the transition of Chief Sunny Odogwu, the Ide Anaba of Asaba. November 8. Outrage as govt claims feeding El-Zakzaky with N 3.5milion monthly. November 10. Oshiomhole returns from ‘exile’, admits seeing DSS. 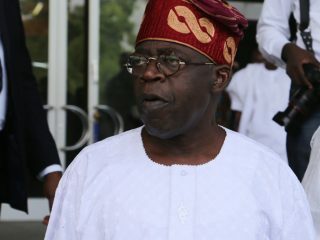 The National Chairman of the All Progressives Congress (APC), Adams Oshiomhole, who quietly slipped out of the country, returned from the United Kingdom. November 11. PDP, others kick as ‘security agents, storm Atiku’s plane. Security operatives allegedly swooped on a private jet conveying the Presidential candidate of the PDP, Abubakar Atiku. The aircraft, which touched down at Nnamdi Azikwe International Airport, Abuja at 1:30 am from Dubai, was said to have boarded by the armed personnel in a search operation. November 12. Buhari signs extradition law, FCT Budget, others. President Buhari assented to an extradition law consistent with extant protocols. He also signed to law, the 2018 Budget of the Federal Capital Territory (FCT). ** Teleology finally takes over 9 mobile. Teleology Holdings Limited finally took over 9 Mobile following the appointment of new Board of Directors of which the chairman was Nasiru Ado Bayero. November 13 Senate condemns FG’s move to reduce MTN’s fine from $8.1 billion to $800 millions. November 14. Senate uncovers fresh $1.151 billion illegal withdrawals from NLNG. The Senate said it again uncovered illegal multiple withdrawals of $1.151 billion from the dividends accounts of the Nigeria Liquefied National Gas (NLNG) by the Nigeria National Petroleum Corporation (NNPC). This was apart from the $1.05billion NNPC Group Managing Director Maikanri Baru earlier admitted to. ** Govt mobilizes N55 billion for Ogoni clean up. November 15. Four family members die, others hospitalised after Amala meal. Four members of a family in Ilorin, Kwara State capital, died after eating yam flour, called amala, suspected to be poisoned. November 16. CAN meets Buhari, seeks Dasuki, El-Zakzaky’s release A presidential order to release detained former National Security Adviser (NSA), Col Sambo Dasuki (rtd) and the leader of the Islamic Movement of Nigeria (IMN), Ibrahim El-Zakzaky, topped the request of the leaders of the Christian Association of Nigeria (CAN) as they met with President Muhammadu Buhari in Abuja. November 17. Eagles draw against Bafana Bafana, qualify for AFCON. Nigeria booked a place in the finals of the 2019 Total Africa Cup of Nations (AFCON), to take place in Cameroon. November 18. The Guardian’s Akpodonor is Nigeria’s best sports journalist. The 2018 Nigerian Sports Award in Lagos, where The Guardian’s Senior Correspondent, Gowo- Akpodonor, emerged the best Sports Journalist of the year (print). November 21. Robbers attack The Guardian’s Editor-In-Chief on Oshodi Bridge. The Guardian newspaper’s E-In-C, Debo Adesina, was attacked by suspected robbers on Oshodi Bridge. They dispossessed him of his phones and other valuables. November 22. Senate in grief, adjourns plenary over 44 slain soldiers. In honour of 44 soldiers killed by Boko Haram in Borno State, the Senate stood down all items on its order paper and suspended legislature duties. ** Zamfara Assembly member sentenced four years for N31million fraud. Zamfara State High Court in Gusau sentenced a serving member of the House of Assembly, Lawali Dogonkade four years of N31million fraud. November 23. Soldiers’ killing: Buhari dispatches Defence Minister to meet Chadian President. ** Customs seizes another 13 containers of tramadol, bleaching soap worth N 3 billion at Tin-Can Port. November 24. Feeding Programme: Why 14 million primary school pupils are shut out. 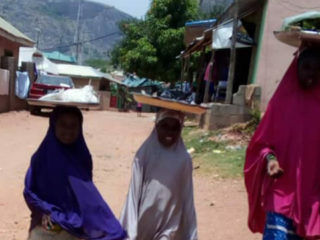 The Federal Government’s inability to raise the sum of N336 billion yearly was responsible for the partial implementation of the much-talked about national Home Grown School feeding programme, and the reason why over 14 million pupils were being denied the mid-day meals, which the APC-led administration promised to carry out if voted into power. November 25. No more conferment of honorary awards on me, says Soyinka. Nobel Laureate, Prof Wole Soyinka, said that the honorary doctoral degree he bagged at the Federal University of Agriculture, Abeokuta, was the last he would accept. November 26. Buhari cautions Oshiomhole, okays suit by APC members. 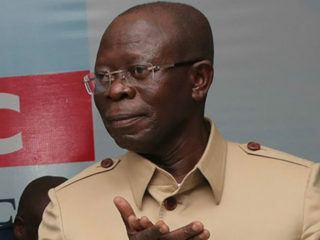 President Muhammadu Buhari cautioned the Adams Oshiomhole-led National Working Committee (NWC) of the All Progressives Congress (APC) against trampling on the rights of aggrieved party members seeking legal redress. ** As Nigeria struggles with N30, 000, South Africa increases minimum wage to N126, 480. ** EFCC rejects Ganduje’s N10 million donations. November 27. N540 billion recovered so far via whistle blowers, says Lai Mohammed. 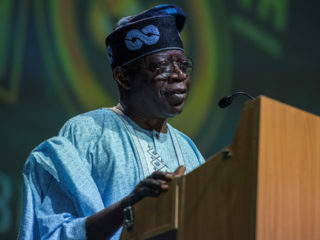 The Economic and Financial Crimes Commission (EFCC) so far recovered over N540 billion through the whistle blower policy, Minister of Information and Culture, Lai Mohammed, disclosed. November 28 FG slashes JAMB, NECO fees, okays N17 billion for projects. The Federal Executive Council (FEC) slashed the fee of JAMB from N5, 000 to N3, 500 effective from January, 2019. Also, it reduced the cost of NECO from N11, 350 to N9, 850 as well as Basic Education Certificate from N5, 500 to N4, 000. November 29. Soyinka, Amukah task teachers, pupils on language uses. Nobel Laureate, Prof Wole Soyinka, and the Minister of State for Education, Prof Anthony Anwukah tasked teachers to guide their pupils on the proper use of language.